Panelists Diane Foley, president and founder of the James W. Foley Foundation, and Washington Post journalist Ja n Rezaian, discuss crimes against Americans abroad at the National Press Club on April 2. The United States must become more effective in holding foreign nations and groups accountable for crimes against Americans unjustly detained abroad, agreed panelists at a National Press Club Journalism Institute event Tuesday. “We must do better,” said Diane Foley, president and founder of the James W. Foley Foundation named after her murdered son. Foley appeared on a panel that included Jason Rezaian, a  Washington Post journalist who was imprisoned 544 days in Iran, and Brett McGurk, the diplomat who negotiated his release. “We must find ways to have the backs of our brave Americans—as journalists, aid workers, educators or those just traveling,” said Foley, whose son, a freelance war correspondent,  was abducted in Syria in 2012 and beheaded two years later. “Unless we hold people accountable for their crimes, unless there’s some deterrent, [they’ll] just keep doing it! They’ll continue to take our citizens,” she said. Rezaian, recounting his imprisonment in Iran, said  “In July 2014, my wife and I were at home. We were ambushed, blindfolded, taken at gunpoint to a prison, thrown in solitary confinement; months of interrogation began immediately, and at no point allowed a lawyer"
“It destroyed my life in the country I chose to work and live,” he said. Although his release was negotiated, he noted that state-sponsored hostage-taking increases daily. 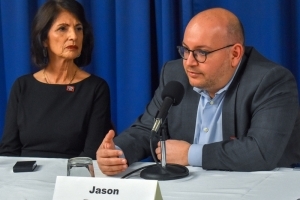 For accountability, Rezaian said he favors first separating hostage cases into state-held hostages, pirates and other terrorist groups, developing different “playbooks’ for each. “We need to develop better deterrent plans,” he said. Another panelist, Terrence Rynne, founder of the Center for Peacemaking at Marquette University, said he views hostage-taking from a restorative justice angle that gives victims and all closely affected by these terrorist acts their own voice. He called for a major public trial in absentia sponsored by “a legitimate organization” where ISIS can be indicted in the eyes of the world. Rynne and a fifth panelist, Karim Khan, a British international criminal law expert and special U.N. adviser leading a new U.N. investigative team on ISIS crimes in Iraq, both cited the lessons of the Nuremberg trials. When those crimes met “the harsh glare of the law,” Khan said, “the principles of fascism disintegrated.” There is no statute of limitation for war crimes. Moderating the event was Nancy Youssef, national security correspondent for the Wall Street Journal.